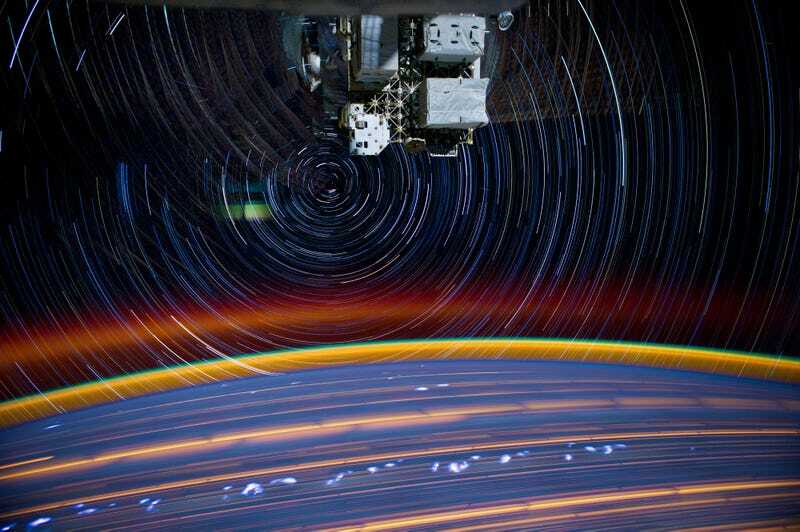 Remember this amazing photo from the ISS? It was actually a series of 30-second exposures, glued together as one. And for this week's Shooting Challenge, I can't get you into space, but I can teach you the technique. Take two (or many more!) long exposure shots and combine them into one image. 1. Not all cameras can take exposures beyond 30-seconds. 2. There's a risk to leaving shutters open for that long, and it drains the batteries. 3. Most importantly, it opens up creative possibilities. Imagine combining a long exposure from a spot in the morning with one at night, for instance, like a sunrise and a sunset. You can create a long exposure that covers more time, so long as you lock down a tripod and revisit the shot. As for HOW you do this, ShutterPhoto has a fantastic, 3-part tutorial that will get you capturing star trails and whatever else you want in no time. Our lead shot is by Expedition 31 Flight Engineer Don Pettit, from 18 different shots. Needless to say, the bar was set pretty (literally) high! Send your best photo by Monday, June 11th at at 10AM Eastern to contests@gizmodo.com with "Exposure" in the subject line. Save your files as JPGs, and use a FirstnameLastnameExposure.jpg (970px wide) and FirstnameLastnameExposureWallpaper.jpg (2560px wide) naming conventions. Include your shooting summary (camera, lens, ISO, etc) in the body of the email along with a story of the shot in a few sentences. And don't skip this story part because it's often the most enjoyable part for us all beyond the shot itself! Mark Wilson is the founder of Philanthroper, a daily deal site for nonprofits.